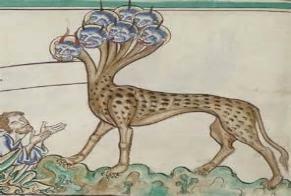 What is the "Seven-Headed Beast" of Revelation? Babylon morphed itself into, or passed itself off as, over the years? "beast" even used as the description of a good, angelic being of God (Rev. of the Field as groups of Pre-Adamite peoples - not necessarily derogatory. and derogatory: the Antichrist of Revelation! Just who might this "beast"
past and the future "beast" of Revelation? behind most everything the Serpent said or did to seduce Eve. Watchers had survived Noah's flood (just some of their mixed offspring). without any chance for redemption. havoc and destroy. Could this angel, known as Abaddon, be Satan himself? mean he was actually released, for a while? 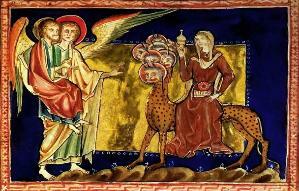 angelic beast(s) of the Garden - the Serpent with Satan as his mouthpiece? influence at work on our world, here - two systematic beasts, if you will! world which are political; the other religious. from the world of religion. was the same as what happened in the Garden of Eden! it continues today. It's amazing to see the parallels - past to future. were said, in Revelation, to have seven heads. What could these "heads"
be, in regards to each? over their world in the past, and not so distant past. ("number 5"); and Rome ("number 6"). The total now is up to 6 "heads." same last four as the above. Roman Empire held sway, and dominated, all of Israel - the six "heads"
over Israel at this time - the one that is! yet come; and when he cometh, he must continue a short space. the sixth "head;" and be revived again. wounded; only to be revived? influences of the city of Rome were, once again, rising in their political hold. Israel! It went down with the "Treaty of Rome." head - a stronghold once "wounded to death;" but healed, in a way? which began at this Treaty of Rome. What fits this bill better? The E.U. surely could be this seventh "head!" ...and when he cometh, he must continue a short space. hundreds of years these empires of the past held their power. conglomeration which comes out of the European Union: the eighth "head;"
conglomeration of countries in Europe which have combined, even further. The Eurozone came into existence on January 1st, 2002.
belonged to the original Roman Empire at the time of John. here, we might be able to interpret these verses in yet another way. hava - meaning "to come to pass," "to let become known," "come to be,"
qodam - meaning "in front of" or "from before"
min - meaning "as a result of" or "by reason of"
before.” Now, what's this all about? What could have happened before? And, what is this "fall?" original countries (or "horns”) of the Eurozone are in financial trouble. There are three or four now in jeopardy of actually dropping, or "falling,"
no kingdom as yet; but receive power as kings one hour with the beast. mountains, on which the woman (or whore) sitteth. Rome is one of the only few cities in the world which sits on seven hills. On top of this, there is a verse that confirms the meaning of these "heads,"
WHICH REIGNETH OVER THE KINGS of the earth. authority, will "ride" atop of a political system (or beast). complete with "city" - appears to have been "revived," in this way? forms (or systems) in Europe, and beyond. some sort of divine authority over all of Judeo/Christian belief. Hebrew priests were actually Kenites. at his trial, and help to facilitate his crucifixion. priests - crush their power. stage was set for a new way. also have these Kenites trying to influence it from within. tradition and interpretation by religious zealots, from then on. The "ways"
attempts to kill it... because it never is truly "rooted up." going on, here; and how to spot "which side is which." Semiramis' "promised one" (in Origins of Babylon 2). culture; into what may or may not be considered "politically correct," today. nothing ultimately pertaining to a strong faith in a heavenly Father. begin to adopt these hollow, politically correct "ways:"
take action, because man has lost their way. like" people may try to make it all sound. The Way of Cain will go even deeper. Apocalypsis Mosis, 16:5, 17:4, trans. R. H. Charles, http://www.pseudepigrapha. Bible (Cambridge, Massachusetts: Harvard University Press, 1998), 124-25. Strong’s H1934 – hava, http://www.blueletterbible.org/lang/lexicon/lexicon.cfm? strongs=H1934 (accessed June 11, 2012); Strong’s H1933 – hava, http://www.blueletterbible. org/lang/lexicon/Lexicon.cfm?Strongs=H1933&t=KJV (accessed June 11, 2012). Strong’s H7920 – sekal, http://www.blueletterbible.org/lang/lexicon/lexicon.cfm? strongs=H7920 (accessed June 11, 2012); Strong’s H7919 – sakal, http://www.blueletterbible. org/lang/lexicon/Lexicon.cfm?Strongs=H7919&t=KJV (accessed June 11, 2012). Strong’s H6925 – qodam, http://www.blueletterbible.org/lang/lexicon/lexicon.cfm? strongs=H6925 (accessed June 11, 2012). Strong’s H4481 – min, http://www.blueletterbible.org/lang/lexicon/lexicon.cfm? strongs=H4481 (accessed June 11, 2012).